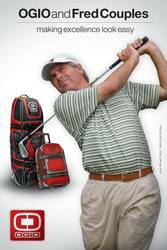 Fred Couples, the 1992 Masters Champion and captain of the 2009 President's Cup, has signed on with the bag manufacturer to endorse its comprehensive line of golf travel gear. The endorsement was announced today by OGIO Global VP of Golf Tom Gocke. In addition, Mr. Couples will be working with the company's designers to create a signature line of travel bags including golf travel covers, rolling luggage, messenger bags and backpacks. "We've received some of the industry's highest honors for creating exceptional golf travel equipment," Gocke says. "The one thing we still needed was that authentic icon who embodied the class, quality and personality of our gear, and we can think of no better fit than Fred Couples. The self-proclaimed OGIO fan began using the company's travel bags during the 2008 PGA season and came to appreciate the products' reliability and intelligent design. "I approached OGIO at first just to thank them for helping make my travels so smooth; when they came back with the idea of creating a signature line - and helped me see it for what it could be - I was in. I look forward to putting this gear to work all season long." OGIO's new signature collection for Mr. Couples will feature eight travel bags including special edition versions of the Mammoth, Monster, and Straight Jacket golf travel covers; the 9800, Terminal, and Layover rolling duffels; as well as the Epic backpack and the Street City Corp messenger bag. The company plans to begin shipping the new line in Fall 2009. For more information on OGIO's golf travel collection or Fred Couples' forthcoming signature line of OGIO travel gear, visit http://www.ogio.com.